Wi-Fi makes a much loved and hardy camcorder better than ever, although the heavy noise is disappointing. It uses a 1/2.33in sensor and has a maximum megapixel count of 16.4 megapixels, as well as an effective 8.3 megapixels when recording video. Although it has only a 5x optical zoom, it can zoom to 18x and 120x digitally. The 18x zoom isn’t too bad, but the 120x digital zoom soon becomes too noisy and pixelated. You can record video at resolutions of 1,920x1,080 at 60fps interlaced and 30fps progressive, 1,280x720 at 30fps progressive and lower resolutions at 30fps progressive. Video is recorded in MP4 format, and Full HD video is recorded at around 15.5Kbit/ s.
We were impressed by the HX-WA30’s predecessor, the HX-WA20, so were pleased to see it looks and feel very similar. The pistol grip is indented in two places, which makes it comfortable to hold and more secure in your hand. It isn’t heavy, but weighs enough to make it feel substantial. Its plastic casing feels tough, as does the touchscreen’s hinge. 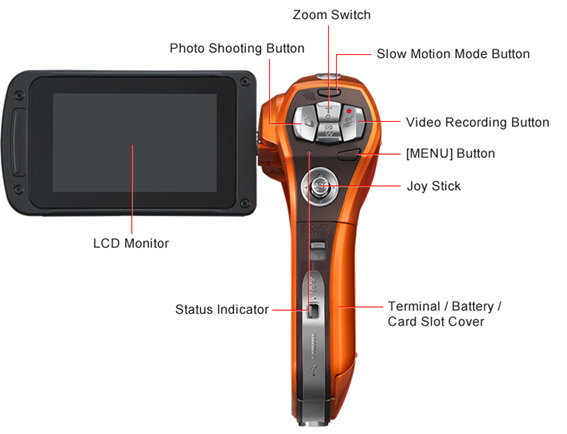 Unlike many other modern camcorders, the HX-WA3O doesn’t have a touchscreen. Instead, you navigate the natural language menus using a small push-button joystick. This is a quick and accurate way of selecting menu options and inputting data. Above the joystick is a menu button, plus a cluster of buttons that let you zoom, take a still image and record video. Another button lets you cycle through a selection of slow motion modes. The menu’s comprehensive options let you set white balance and exposure settings, switch to manual focus and change zoom mode, among other functions. The HX-WA30 makes is easy to connect to your Wi-Fi router. You simply press the Wi-Fi button on the side of the camcorder and then select your access point. 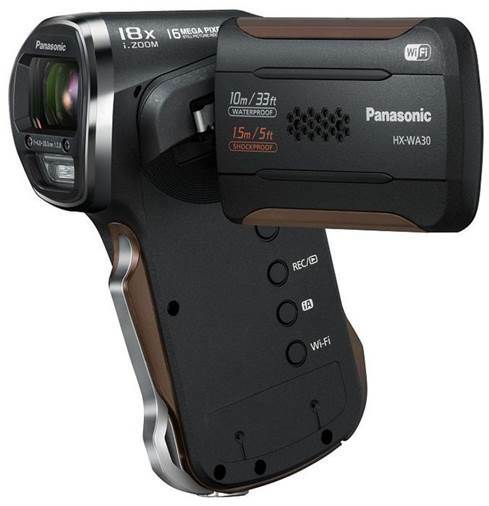 Many touchscreen camcorders, including the Ultimate award-winning Panasonic HC-X920, make you use a number pad to input alpha-numeric characters, as you would on an old smartphone. This makes entering passwords difﬁcult, as you have to use these camcorders’ resistive screens. With the non-touchscreen HX-WA30, you enter characters using the navigation joystick and choose them from a full complement of alpha-numeric characters. This is a far more comfortable and precise means of connecting to your Wi-Fi network. Once connected, you can use your i0S or Android device to control the HX-WA30 remotely, or set it up as a DLNA server so you can stream videos and photos to your laptop or smart TV. We had no trouble streaming videos and photos to our laptop. To control the HX-WA30 remotely, you must download the free Panasonic Image app from Google Play or Apple’s App Store. The app also lets you stream footage stored on the HX-WA30 and upload photos and videos to social-networking sites, including Facebook, Twitter, YouTube, Picasa and Flickr. When using your mobile device as a remote, you can see the HX-WA30’s remaining battery life, the remaining number of photos you can take and the recording resolution. You can also use an onscreen slider to adjust zoom. Although we like the functions provided by the image app, and it has improved since we ﬁrst used it, we’re still unimpressed by the zoom slide’s responsiveness. It is, however, an excellent app if you just want to monitor action with the HX-WA30. Should you be nowhere near a router, you can wirelessly connect a mobile device to the HX-WA30 directly. This is an especially convenient feature for a camcorder that’s designed to be used outdoors. We saw no difference in footage quality between the HX-WA20 and the HX-WA30. Both camcorders have good image quality considering they shoot video in MP4 format. The effects of compression are certainly apparent, but not to the extent we expected, given its ﬁle format and bit rate. Objects, for instance showed relatively good amount of detail. A wall’s grouting and staining showed a good level of detail, too, and we could still make out individual bricks in a wall that was 20-25 meter away from the lens. Sadly, the HX-WA30 sometimes lost focus momentarily when zooming. There was also a lot of noise on footage shot in indoor and dark environments. Noise was also present outdoors, and footage sometimes became uncomfortably noisy when we zoomed. A bright blue sky, for instance, was very noisy. The HX-WA30 mostly reproduces color well, especially the color of organic objects but shiny metallic objects and objects with ﬂat surfaces often looked washed out, with a slightly unnatural hue. We tested the HX-WA30‘s waterprooﬁng by holding it under a running tap, and it worked perfectly afterwards. Having used the HX-WA20 underwater and in a gale without issue, we’re conﬁdent the HX-WA30 will perform just as well in harsh environments. Although we’re less than happy with the noise produced by the sensor, we’re happy with the rest of our footage considering the HX-WA30‘s price and its role as a pistol-grip action camcorder/camera. We also like its easy-to-use Wi-Fi functions. If you need a camcorder you can take anywhere, even the sea, Panasonic‘s HX-WA3O is a great choice.